I get it. Finding a diaper that will last your kid through the night can be hard, especially if you have a kid that drinks a lot of fluids before bed, or nurses through the night. Thankfully there are a ton of options out there, and one WILL work for your kid! It may just take a bit of trial and error. Firstly–here’s what currently works for my 6 month old girl. She sleeps from 8 pm to 4 am in one stretch. We use a Nicki’s Diaper brand bamboo AIO, with a Geffen newborn super absorber under the tongue. We top it with a fleece liner to keep her feeling dry, and I coat her bum in a nice barrier cream–Seventh Generation’s Coconut Care is my current favorite. She wakes up to feed at 4 am and we change her diaper–I use a Nicki’s Diaper brand ultimate AIO at this point. We’ve replaced the microfiber in it with their ultimate bamboo insert. It absorbs more, and holds her from 4 am until she gets up around 8 am. Nicki’s Diapers brand bamboo AIO in Northern Lights print. I know this is the case for some, and in this situation you will need something a bit more absorbent to prevent middle of the night changes. Or perhaps your kid is older and sleeps 12+ hours in a single stretch. The best solution in these cases is usually a fitted diaper and a cover. Fitteds come in many materials, but typically the most absorbent are the bamboo fitteds. For a fairly bulletproof overnight solution, pair a bamboo fitted with a wool cover. If your kid tends to sleep on their tummy, you can add a small hemp booster up in front to help prevent leaks–same if they sleep on their back. A variety of fitted diapers. The one drawback to fitteds is their bulk. Some people don’t like how bulky they are–but GroVia recently came up with a trimmer option that works for many. The GroVia O.N.E is a great overnight solution that is very easy to use. It’s also great for daytime use–many have an entire stash of them! 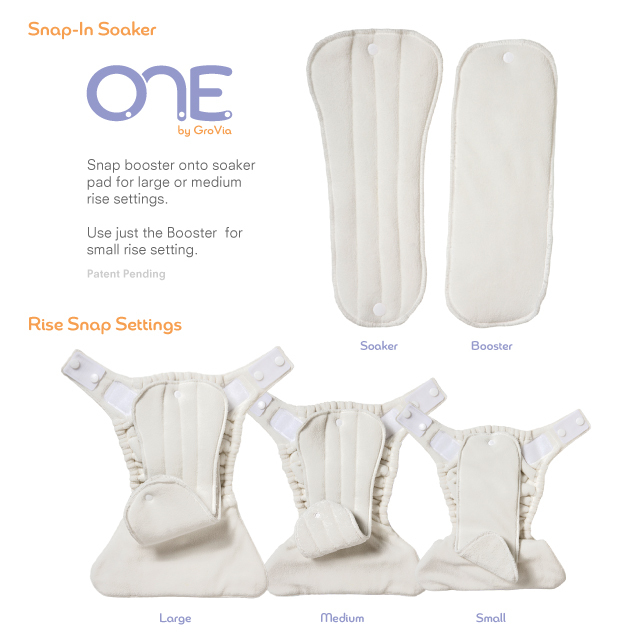 The diaper is an all-in-one style with 2 inserts included; one small booster and one large soaker. For overnights, snap both inserts in for great absorbency. You can even add a hemp booster and they will still be less bulky than a fitted. My little girl is still on the smallest rise setting, but needs the larger soaker for regular use–so we just scrunch the insert a bit to make it fit. Make sure to wash this diaper and inserts 3-4 times before attempting to use it overnight. With the right inserts, you can create an overnight solution with your current stash. If you have pockets, you can double stuff them with a cotton prefold or flat and a hemp insert/booster and see if that works for your child. You can always add absorbency to most diapers–many AIOs have a small pocket to add absorbency too if needed. If you have covers and flats, try wrapping a hemp or cotton prefold in an FST. These solutions can typically work for all but the heaviest of wetters. The latest overnight solution from Smart Bottoms looks pretty great too! 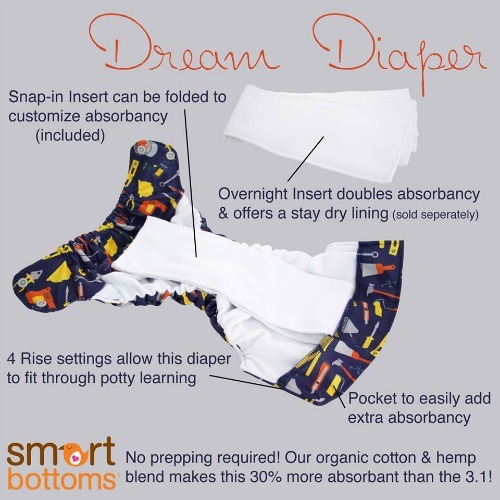 The new Dream Diaper from Smart Bottoms could be one of the better overnight solutions out there. It is even trimmer than a GroVia O.N.E! It is cut very similar to their regular 3.1 AIO diaper, but it requires no prep washes! Wash once and it is good to go. The inner is made out of a hemp/cotton blend so it is more absorbent than a fully prepped 3.1. It has a pocket where you can add extra absorbency for a heavy wetter, and the soaker snaps out so you can replace it with an overnight insert, sold separately. Every child is different, and some or none of these solutions may work for you. Overnight diapering usually requires a little trial and error, and your childs needs may change as they grow! Tune in next time for 12 Days of Clothmas: Traveling With Cloth. Previous 12 Days of Clothmas Day 7: Cloth Storage Solutions! Next We Only Get One Earth.